HPS has a unique academic philosophy. We train students to make a difference in whatever they do and leave their footprints on the sands of time. The difference between ordinary and extraordinary is that little ‘extra’. Almost all the top schools vie for academic honours and lay great stress on results. While good results have always been a priority what makes HPS special is the fact that students are taught to leave a blazing trail where once there lay a beaten path – to do ordinary things in an extraordinary fashion. That is why probably HPS has down the ages managed to produce many high profile achievers who have done the alma-mater proud. Pupils are taught to soar high and told that while some may succeed because they are destined to most succeed because they are determined to. Education is akin to an apple tree, though the roots are bitter, the fruit is sweet, but at HPS, even the roots of the tree – ‘the learning process’ is sweet. The Hyderabad Public School, Begumpet is divided into three sections – the Primary encompassing Classes I to V, under the Headmistress; the Middle School consisting of Classes VI to VIII under the Head-Master and the Senior School comprising Classes IX to XII headed by the Vice Principal to facilitate convenience in administration. The school follows the ICSE & ISC syllabus and is a member of the Indian Public School Conference. The School follows the ICSE & ISC syllabus. Classes I to VIII school curriculum has subjects like English, Mathematics, General Science(Physics, Chemistry, Biology), History & Civics, Geography, Language-I (French, Hindi, Telugu, Urdu), Language-II(French, Hindi, Sanskrit, Telugu), Computer Science, Value Education and General Knowledge. SUPW, Art & Craft and Yoga are also part of the school curriculum. The Senior School offers Environmental Education and Optionals (in lieu of Language-II) in addition to the already existing ones. These Optionals include – Art, Commercial Applications, Computer Applications, Economic Applications, Home Science, Physical Education and Yoga. At the ISC level (XI & XII) students can pursue either MPC,BiPC, MBiPC, AEC or BEC with an Optional chosen from a wide range. 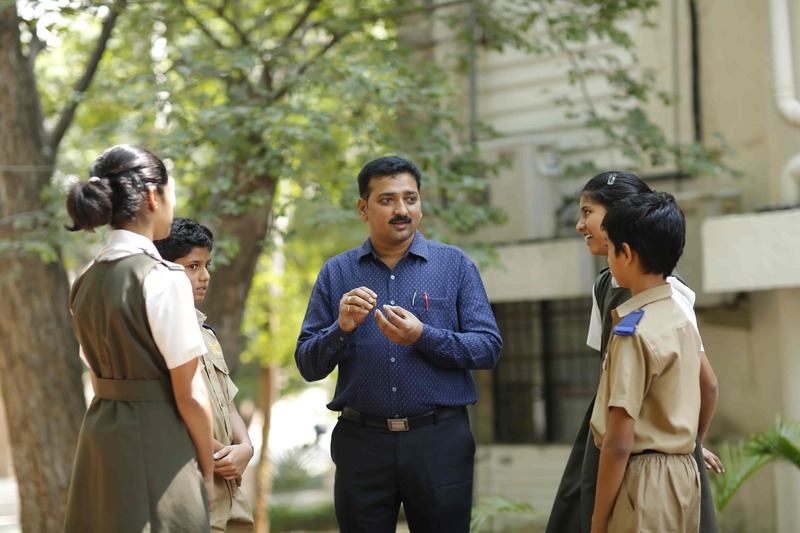 Though the syllabus is in accordance with the guidelines laid down by the Council for the Indian School Certificate Examinations it is heartening to note that both the Council and the School have always been willing to keep in mind modern trends in education and the subject needs of a dynamic society. This rigorous syllabus is made convenient as all teaching is pupil centred and learner friendly. SOF is an Educational Organization popularizing academic competition and assisting development of competitive spirit among school students. SOF was established by leading academicians, scientists and media personalities with the aim of promoting science, Mathematics, Computer Education, English, General knowledge and professional courses .All activities of the Foundation invariably aim at making learning an interesting and interactive process in which the learner is actually able to put his/her skills, memory, talent and knowledge to test. The Eaglets of The Hyderabad Public School, Begumpet are every year taking part in various competitions conducted by SOF. Aditya Lahiri of class 9D, Sai Rithvik Nunna of class 10 and Joshua Sequeira of class 11 were among the Zonal Top – 25 Medal winners securing 14, 6 and 4 Zonal ranks in the English Olympiad. M. Ankitha of 6D won Gold Medal in the category of School Topper Medal Winners in English Olympiad. Mohul Dutta of class 9D secured 8 rank in the Zonal category with a medal of Distinction in Science Olympiad. Y.V Gaurav Reddy of 7E secured Gold Medal, Pradyumna Seetham Raju of class 10A secured Gold Medal, Anusha Mahanti of class 10A secured Silver Medal and Amsh Balabhadra of class 10A secured Bronze Medal in Science Olympiad in the category School Topper Medal Winners. P. Divith Reddy of class 6D, Sujay Nunna of class 7C, Aryan Keluskar of class 8G and Anusha Mahanti of class 10A won School Gold Medal in Maths Olympiad. Eduranet firmly believes that healthy competition prepares students for life. Eduranet Intellectual Olympiad brings out students inherent talents, rare abilities and trains their skills. 55 students from Middle and Senior school appeared in various competitions on 28th November, 2018 in Maths, Science and Research , Analytical and Problem solving skills, Critical thinking and Creative Skills, Basics of Computers and WWW Skills, Leadership and Social Skills, Presentation and Communication Skills and G.K and Awareness skills. 21 Students qualified for final level. The Final level exam was conducted on 31st January, 2019.Result awaited. NTSE is a National level scholarship program in India to identify students with high intellect and academic talent.27 students from class 10 had taken NTSE examination on 4th November, 2018. Results are not yet declared. USO conducted United Nations information test on 31st August, 2018. 30 students of our school appeared for this test. Participation certificates were awarded to all the participants.